(Un)touched is a slow-cooked collaboration between choreographer Angela Woodhouse and sculptor/visual artist Nathaniel Rackowe which explores not only movement and architectural space but also themes of intimacy, isolation and separation. As the installation performance has been developed over a number of years, both artists have been able to deepen understanding of each other’s practice, and the resulting performance communicates this effectively. Having presented (Un)touched part 1 last year during Rackowe’s solo exhibition at Canary Wharf, now for the Fold Gallery, Rackowe’s completed diptych consists of a vertical, corridor shaped sculpture made of steel mesh, glass and florescent tubes, and a horizontal glass platform. 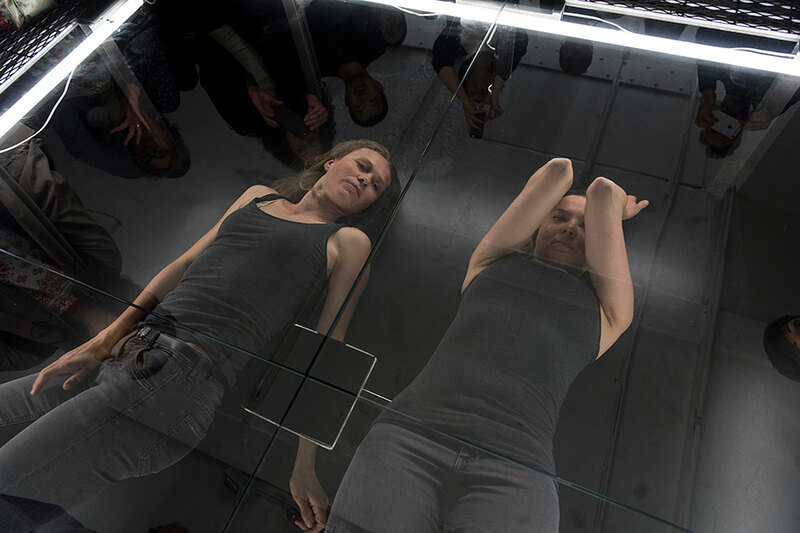 Both dancers, Martina Conti and Stine Nilsen, as well as audience members can occupy or walk around. The installations complement the architecture of the narrow L-shaped basement gallery as if they’ve been made specifically for the space. It’s an intensely intimate viewing experience, not only because we are up-close to the dancers but also because the installations enable multiple viewing perspectives Although Rackowe’s sculptures are made of unyielding materials – mesh, glass, steel and light bulbs, through interaction with the dancers they appear soft and malleable, while also existing as objects that separate and divide. Nilsen and Conti walk quietly into and around the outside of the vertical sculpture. Their understated, minimalist pedestrian movements allow them to excavate both their own bodies and the solid objects which they encounter. As they navigate their journeys through the structure, parts of them are visible though the steel mesh, glass and its various openings. While it feels voyeuristic watching them as they move in such a preoccupied and private way, we are also confronted with our own reflections as we observe them. This is both disarming and fascinating, like walking into a hall of mirrors, but it creates a world of endless surveillance and viewing possibilities as well as further dividing and fragmenting the performance experience. Conti and Nilsen explore the space, the installation and each other’s forms without making direct contact, their interaction always mediated by a panel of glass or steel meshing. On this lonely journey they exist within parallel universes, but sporadically manage to forge strong, tactile connections with one another. Standing on either side of the partitions, their wrists fold softly into the hard surfaces, or foreheads roll gently around the same point on either side of the panels. Similar duets are repeated in other parts of the installation incorporating different body parts. With bigger, distorted actions the women push their chests against the glass or graze it with their jutted out pelvises. While dynamics are slow and even-paced, quiet rhythms build steadily through the various bodily articulations. Both women are captivating to watch in their internalised yet purposeful states of being. At one point, Stine’s body traces the reflected outline of Conti’s, as she moves on the other side of the glass. From where I’m standing I can see Stine inhabiting the contours of Conti’s shapes. This morphing of real body into the reflection of the other is mesmerising. The intensity of their encounters are enhanced and edited by the sequencing of the fluorescent lights as they abruptly turn off and on. With the lights off, the darkness and the absence of reflections bring relief, but they also add another theatrical layer to the work, bringing mood, colour and a refreshing sense of beginnings and endings. The second performance takes place underneath the horizontal, low platform. Here Stine and Conti huddle together as if united through death in a tomb. Slow turning towards each other or rolling away as much as the confines of the glass cover and the sides of the structure will allow, they are together at last, without separation or divisions. Now they occupy one shared world, which I, standing above on the transparent glass can watch, but am excluded from. It’s a strange sensation – like walking over somebody’s grave. This reconciliation makes for a poetic ending to the performance. Woodhouse’s choreography is as intricately layered as Rackowe’s sculptures, and her curiosity in the relationship between performer and spectator invests the formidable structures with tactility and emotional depth.